Fashion Architect: Good crazy or bad crazy? I'm nursing a bad hangover from last night's party sporting pyjamas, my boyfriend's hoodie and a face that kinda reminds me of Courtney Love, so no pics today. However, the circumstances were asking for an eggs-and-bacon breakfast (yum-yum) and a tour of my favorite celeb gossip sites, where I did notice a pattern that led to a question: Are celebs are getting crazier or is fashion getting too weird? And is that a good or a bad thing? I don't have enough brain cells left today to decide, so I'm asking you instead. What do you think? Picture of Katy Perry via Egotastic, picture of Victoria Beckham via Holllywood Rag and picture of Beyonce via Dlisted. 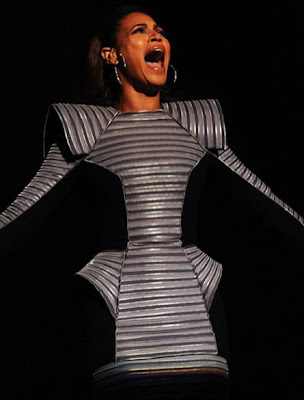 ***UPDATE*** Bryan Boy also did a post on Beyonce's crazy Gareth Pugh armor dress and he seems just as confused as the rest of us. i saw this outfit of beyoncé... i think its a bit too strange.. what does she want to say with it? I am definitly not loving the beyonce dress. She looks a little bit like an anorexic alien. And I don't know how I feel about Katy Perry's dress I think I like it in itself . . . just not on her. But I have to say I actually love those shoes! Zaniness abounds. I'm not sure I don't like it, though; if celebs weren't zany, than they wouldn't have such high entertainment value! I love Katy crazy outfits! cause she always been like that..
and about Beyonce - The crazy outfits are good only for the shows..
Της Perry είναι ωραίο,και τα παπούτσια της Beckham πιστεύω ότι ταιριάζουν στο στυλ της..
Για το φόρεμα της Beyonce θα πω μόνο..WTF?? I really don't know if I like totally crazy and extremely fashion-forward outfits. I mean it's great to see people doing different things (like katy for example), but I prefer to see some other clothes as artwork or at least worn at shows etc. But on the other hand I kind of like this crazyness! those shoes are crazy! who could possibly walk in them and feel totally pain-free? Not keen on Beyonce's dress at all. Katy Perry can get away with her quirky choices because it seems to suit her perfectly. Same goes with VB's killer heels, it's so her and she knows how to work it.